I'm used to sharing what happens in my kitchen each month, but this post is about foods that come from outside of my kitchen and often never make it home. 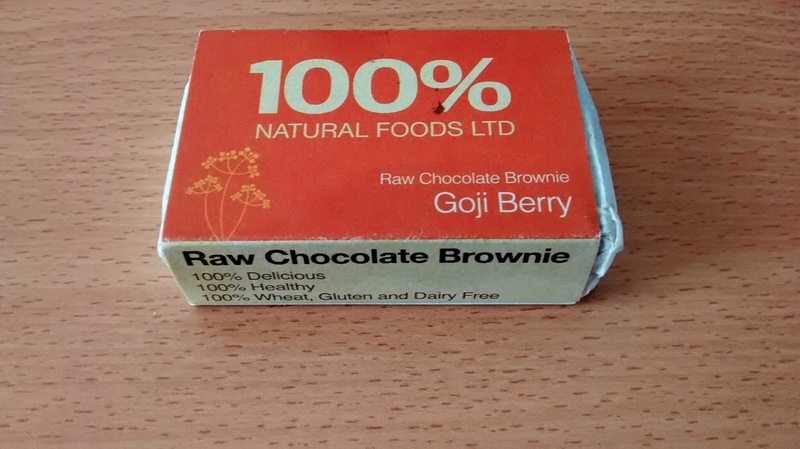 First up: 100% Natural Foods raw chocolate brownies. 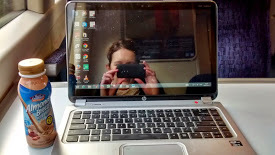 Despite the slight dryness, I have got through three brownies in the last two months. In addition to the goji berry flavour above, I've tried coconut (probably my favourite) and chia seed. Equally decadent but not at all raw is this chocolate-hazelnut Ms Cupcake cupcake. 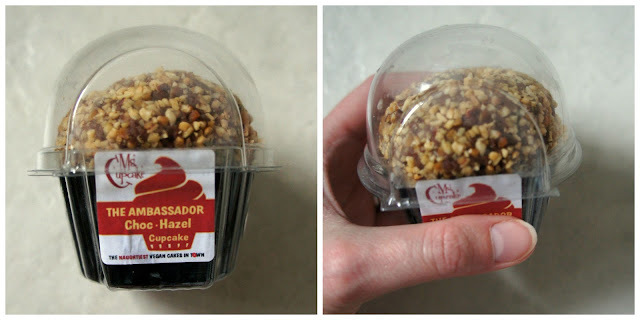 I've previously had Ms Cupcake goods (all vegan) from their Brixton-based store, but the company now has cupcakes in Whole Foods. Not bad for a small business that originally started in a home kitchen! Slightly healthier but also from Whole Foods was this soba noodle salad. I've had a few products by Laura's Idea over time and like the range of dishes they make. This salad is perfect for summer, atlhough as it doesn't have much in the way of protein, I paired it with some flavoured tofu (this was a meal that made it back to my kitchen!). For those days when I'm out and about and Whole Foods isn't near by, it's nice to know I can now find vegan food at Caffe Nero. In addition to the hoummous and falafel wrap pictured below, they have a falafel salad with tabbouleh and a mint-beetroot dressing. 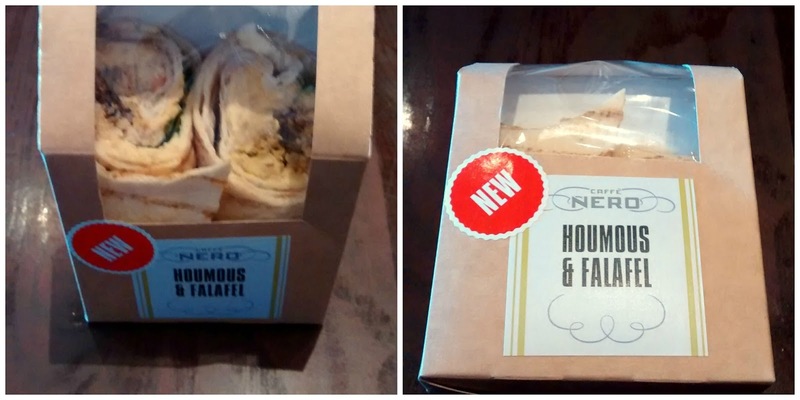 I prefer the salad (although forgot to photograph it) but am impressed at both additions to their packaged range. I also like that the back of each pack clearly states 'vegan'. It seems like every month that passes brings more accessible vegan food, and I confess to feeling very spoilt a lot of the time!. What food discoveries have you enjoyed lately? Kari, I'm envious of all the vegan goodies you have access to. I think if I had brownies available, even if they were a little crumbly, I'd eat them too, purely to support a vegan product! The tofu looks yummy too... and I love it when products proudly state 'Vegan' on them!! Me too! And yes, even if vegan treats are slightly below perfect, I figure it's worth it to support them and they are normally still enjoyable! 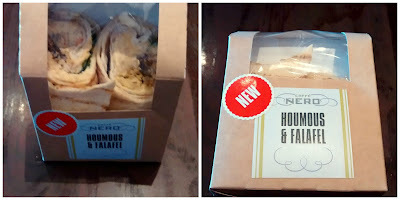 I think that is awesome that cafe nero are serving vegan food now. I think they are also realising that they are not just good choices for vegans, but people that want to eat healthier too. 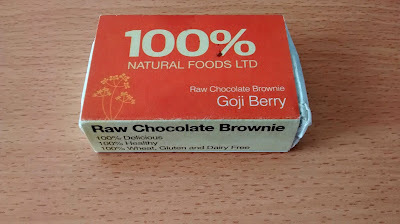 I really like the retro packaging of the raw chocolate brownies - how nice to have it as a choice and to feel there is so much good vegan food out there. The salad and smoked tofu meal sounds like an excellent healthy ready meal. I love the packaging too :-) You can imagine my delight when I saw the bars all lined up on display! Coconut pairs well with many things, but chocolate in particular! I can certainly understand why some of them wouldn't make it home! It is a shame about the brownie, but excellent that you found good vegan cupcakes. What a great idea.